Nirvana’s bohemian design adds a homey touch to the five star amenities, and having your own private beach is the cherry on top. The villa has kayaks so you can get out on the water, and there’s loungers on the beach for anyone who would rather sunbathe. Nirvana’s bedrooms are really well spread out, so you and your guests can relax in privacy. There’s even a beach level suite with a king bed and twin bunk if you bring another family with you. Nirvana is perfect for travelers who want luxury and coziness in one beachfront villa. 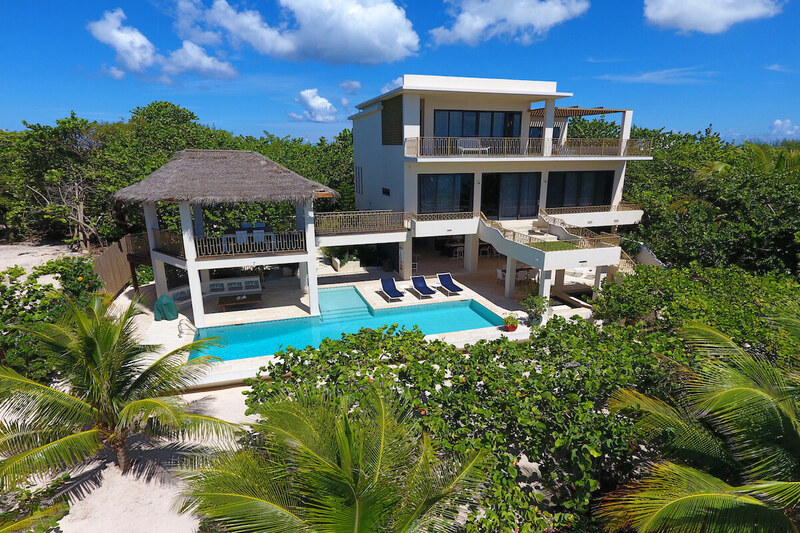 This five-bedroom vacation rental has floor-to-ceiling ocean views, an open-concept design, top-notch amenities, and an ideal location near George Town. Nirvana’s beachfront location gives guests their own slice of the sand and sea. With three kayaks and plenty of loungers, guests can spend all day exploring the ocean, sunbathing, and building sandcastles. Speaking of sunshine, Nirvana has energy-efficient solar panels all along the roof. Relax in privacy on the sundeck, which surrounds the pool, al fresco dining, and lounging areas. In the pool, guests can swim laps or wade in the kid’s area. The deck is multi-leveled and has several dining areas, so guests can spread out all over the property. Under the veranda, there’s a powder room and an outdoor kitchen with a stovetop, sink, and bar equipment. Each level of the home has its own lounging space with stunning views. Inside, Nirvana features bohemian decor with a touch of elegance. Upon entry, guests are greeted by a small foyer and a staircase. The staircase leads up to the Great Room, which is decorated with honeycomb tiles and floor-to-ceiling views. A cozy sectional wraps around the living room, and a flatscreen TV sits at the front. On the opposite side of the Great Room, a long, wooden dining table sits between the kitchen and living room. The open-concept kitchen is fully equipped with a large prep counter, modern appliances, and a Keurig coffeemaker. Nirvana’s bedrooms are spread out all over the property, starting with a detached king suite on the sundeck. The suite is the height of bohemian luxury, with hand carved furnishings, a four-poster king bed, and access to the sundeck. Around the corner, there’s a children’s room with two twin beds and an ensuite bathroom with a walk-in shower and oversized countertop. Upstairs, there’s a queen suite with a study and an ensuite bathroom. The media room around the corner also has two twin Murphy beds. On the top level, there’s a king suite with access to a private balcony and an expansive ensuite bathroom. The bathroom has a rain head shower, a walk-in closet, and an open-air extension with a soaking tub and shower. The bathroom opens to an outdoor hallway that leads to a separate suite with two queen beds. Nirvana is only a 10-minute drive from Seven Mile Beach, and is near all of George Town’s shopping and dining. This villa has the latest technology with a Sonos sound system, iPad, Google Chromebook, and Apple TVs. This villa is beachfront. Shoes are not required on the beach, however some guests prefer shoes to enter water as there is some soft turtle grass at the shoreline.